One of the most interesting problems that financial managers face in their careers is how to determine the value of cash flows that are expected to be generated in the future, today! For instance, consider your local government has to pay out $10 million in annuities to lottery winners, but at the moment, it is short of cash. The government also wants to increase state revenue by spreading the size of the payments over a longer period of time, instead of paying out a $10 million amount via a one-time payment. Suppose the government pays out $1 million over the next 10 years, how much would this save the government each year? The answer depends on the time value of money, and valuation of future cash flows, using time value of money. 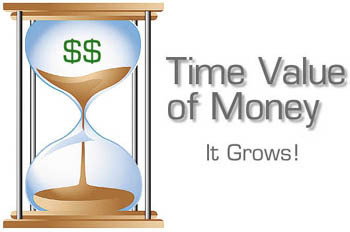 Generally, time value of money refers to the fact that a dollar in hand today is worth more than a dollar promised at some point in the future. The reason for this is that you can earn interest while you wait, so a dollar today would grow to more than just a dollar tomorrow. The difference between money now and money later depends on many variables, one of which is the rate of return earned (interest rate) by investing. Future value refers to the amount of money an investment would grow to over some length of time at a given interest rate. In other words, future value is the cash value of an investment at some point in the future. This point of time can be annual (1 year from now) or in periods (semi-annually or 6 months from now) or quarterly (3 months from the present). Consider another example where you are getting 20% interest rate per every quarter (3 months). In this case, your money would grow to (1 + 0.2) = $1.2 at the end of 3 months (1st quarter). We are just trying to say that a single period does not necessarily have to be 1 year, it can be 1 quarter, 1 semi-annual period (6 months) or even 2, 3, 4, etc. years. This practice of leaving your money and any accumulated interest in an investment for more than one period, thus reinvesting the interest is called compounding. Compounding interest means earning interest on interest, thus the results are compounded. Compounding interest works opposite with simple interest because simple interest is calculated on the original principal alone. The formula below is how we derived the $121 growth of $100 in 2 years, at 10% interest.